HoHO! You did not expect to see the Purple Ninja here today, and yet here I am! The Purple Ninja has planned it this way. The Purple Ninja has lain in wait for many months. Watching. Waiting for the perfect time to strike. 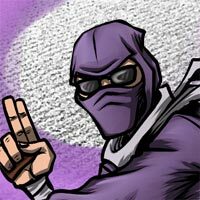 The element of surprise is a ninja’s greatest weapon, and by ignoring the posting schedule that Purple Ninja agreed to when signing his freelance writing contract, Purple Ninja has gained the upper hand! HOhoHo! Purple Ninja graciously accepts your unconditional surrender. In need of some sage truth regarding gift giving. The wife always “likes” the presents I give her, but it seems she is never fully pleased. What is a sure fire gift to please her this holiday season? Oh, and what is the best pizza to order? Holiday season? Hmm…Purple Ninja is beginning to see the downside of his delaying tactics. Very well! Henceforth, Purple Ninja will answer your questions more frequently (Also, Purple Ninja is not sure that “henceforth” is a very ninja-y thing to say)! Still, the wisdom of the Purple Ninja is timeless, so on to the answer. As with all forms of competition, the Purple Ninja has mastered the art of gift giving. Make no mistake, Gardener of Happenstance, it is a competition. You and your spouse are locked in a fierce battle to determine which of you is more in touch with the other’s desires. The Purple Ninja has bad news for you, Accidental Greenskeeper. You have already lost. And not just because the Purple Ninja took five months to answer your question. By seeking the Purple Ninja’s help in the first place, you have admitted that you are the lesser gift-giver. Your spouse has emerged the victor. All is not lost, my friend! Well…I mean…for this year, yeah, it’s probably lost. But next year, you shall be prepared, for you shall be armed with the wisdom of the Purple Ninja! HoHO! Said wisdom is as follows: Things are fleeting. Only experience is lasting. No matter how special the gift you select, be it jewelry, or a new car, or those luxurious, hand-tooled, leather tabi boots that Purple Ninja has had his eye on, it will eventually be cast aside. So do not buy items for your beloved. Share experiences with her. Travel with her to faraway lands. Learn useful new skills together. 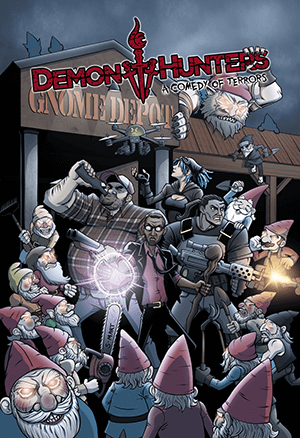 Take up a unique and interesting hobby as a couple. Purple Ninja suggests an experience that ticks all three boxes: Train together at the Dojo Arigato! Together, you shall share in the brutal and lifelong training required to perhaps one day become worthy of bearing the title of Purple Ninja. An experience such as this is bound to bring you and your wife closer than ever. You shall forever be known as the giver of the greatest gift. At least until you are pitted against each other in a winner-take-all deathmatch to win the respect of the Purple Ninja. Purple Ninja does not believe in Second Place! HoHO! And as for your second question, the answer is always, “the one with the most meats.” At your local Pizzajitsu franchise, that would be the “Barnyard Tsunami” which comes laden with pepperoni, bacon, ground beef, ham, and three kinds of sausage. Yes, it is an unfortunate and insensitive name, and I have expressed my displeasure to the manager. Which is to say that I have crept into his home as he slept and spelled out an angrily worded message on the wall of his bedroom in poison-tipped darts. Purple Ninja trusts a menu change is imminent. The Purple Ninja’s wisdom ends here. You need read no further! And fear not, my friends. The Purple Ninja will return soon. Perhaps sooner than you’d expect! BLINDING FLASH THEN RUN AWAY! 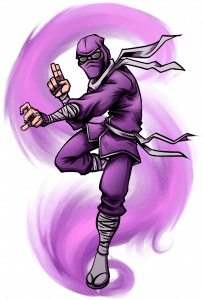 The Purple Ninja is the greatest Demon Hunter of them all, master of the Seven Essential Forms of Martial Arts, and Hide and Seek World Champion sixteen years running! Purple Ninja has not been absent for the past five months. Purple Ninja has been present. Very present. He has been watching you. He has seen the things you do when you think you are alone. Such terrible things. Purple Ninja is disgusted by your actions.